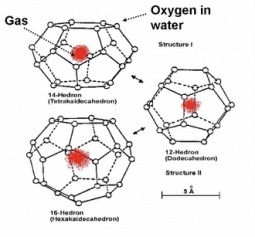 Gas hydrates are crystalline solids materials similar to ice crystals, where non-polar small molecules, such as CO2 and CH4, are trapped in solid crystals, of cages of water molecules linked by hydrogen bonds. 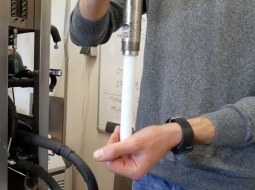 Hydrates are formed in water (0 - 10 °C, 10 - 45 bar) in an intensive exothermic process resulting in a significant reduction in occupied volume (up to 170x for CO2). This drastic reduction in volume, permits the storage and transportation of CO2at nearly atmospheric pressures in the form of an icy material at mild low temperatures, and alternative for the transport and long-term storage of CO2, from flue gases of power plants or generated at oil and gas exploration platforms, and can be applied in the re-injection of CO2into oil reservoirs for EOR. The industrial production of such hydrates can be implemented by strongly mixing the gases with water under favourable conditions of temperature and pressure. The efficiency of this process depends on: gas-liquid heat/mass transfer rates; mixing intensity for promoting crystallization; and precipitation/separation of hydrates. The crystals formation/growth step is strongly exothermic, and temperature control is a key extra production restraint. The HGtS technology, based on NETmix, is particularly suited for the production of hydrates, since the typical difficulties of gas-liquid reactions, mixing and crystallization can be effectively overcome. 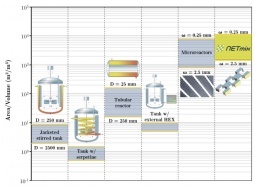 The NETmix technology allows for the effective control on the mixing of phases and reactants, and the reactor specific heat transfer areas can be several orders of magnitude larger than alternative existing reactor/heat-transfer technologies. The NETmix devices are also quite compact, in terms of sizing and mechanical robustness, and also straightforwardly scalable. 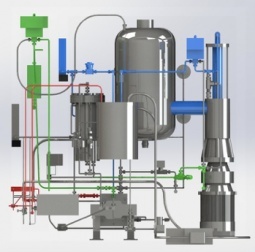 The technology can be applied for the development of industrial processes for capturing CO2 and other gases, at high production scales, as required for power plants and for offshore oil platforms.